Suwannee Hulaween 2018 Ultimate Incident VIP Tickets include all music, art and primitive camping for Friday, October 26, 2018 to Sunday, October 28, 2018. Upgrade your Suwannee Hulaween experience with one of our VIP packages, including a wide range of amenities. For General Admission Ticketing information, click here! All General Admission Tickets, Ultimate Incident VIP Tickets & Packages, Car Passes and Thursday Pre-Party Tickets go On-Sale Tuesday, March 27th at 11am ET/10am CT. Please make note that although earlier entry to the campgrounds and venue is possible, the Ultimate Incident VIP Program benefits don't begin until an hour before the show starting on Friday, October 26th, 2018. **Now that gates are open, you can only purchase a Pre-Party Pass at the Box Office (not online or by phone) for $130. What Will Be Available For Purchase Online? VIP Swag Bag including Hulaween 2018 Poster, T-shirt, Laminate & more! NOTE: Car Pass and Thursday Pre-Party Pass are not included. Every VIP guest wishing to bring their car, truck, SUV, mini van or other standard vehicle into the VIP Campgrounds will need a VIP Car Pass. VIP Car Passes are for VIP ticket holders only. If purchasing a VIP Car Pass, all guests in your party must be VIP ticket holders. General Admission attendees will not be permitted in the VIP Campgrounds. Due to space constraints, RV’s are not permitted in the VIP Campgrounds. However, VIP ticket holders wishing to bring an RV to the festival may either purchase a Primitive RV Pass and camp in GA Campgrounds or purchase an upgraded camping site directly from the Spirit of the Suwannee Music Park. Includes One (1) Glamping Tent with choice of (1) Queen or (2) Twin sized beds with box springs, mattresses, and pillow top, nightstands, lamps, area rugs, dining table, (2) chairs, linens, (4) down type pillows (we will reach out to you regarding the bed types you are requesting once the festival gets closer). NOTE: Thursday Pre-Party Passes are not included. 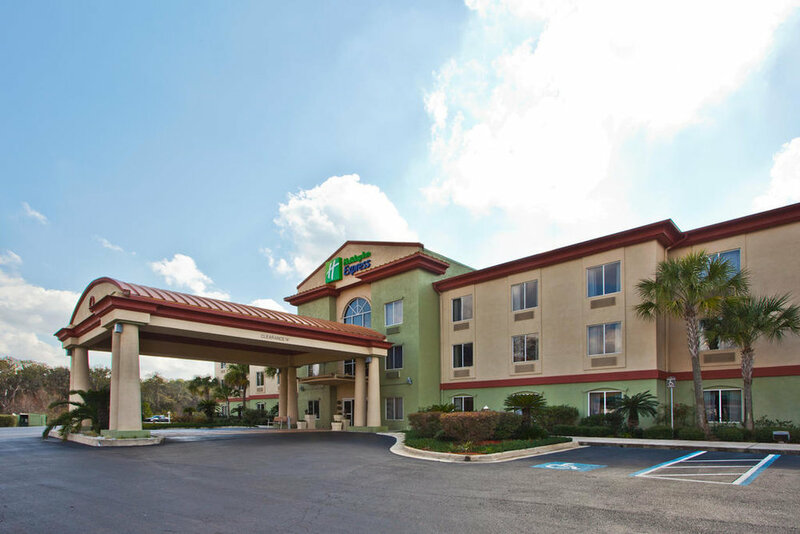 Includes One (1) Room at the Holiday Inn Express in Live Oak with Two (2) Queen sized beds, Cable TV, coffee maker and more. Guests can enjoy a hot breakfast featuring scrambled eggs, sausage and cinnamon rolls courtesy of the hotel. NOTE: Car Pass and Thursday Pre-Party Passes are not included. NOTE: You must be 21+ to purchase this package and check-in to the hotel. One (1) RV Rental including: Dining area, power hookups, climate control, kitchen with sink, microwave oven, and refrigerator, bathroom with shower, daily water pumping and refilling & waste pumping. 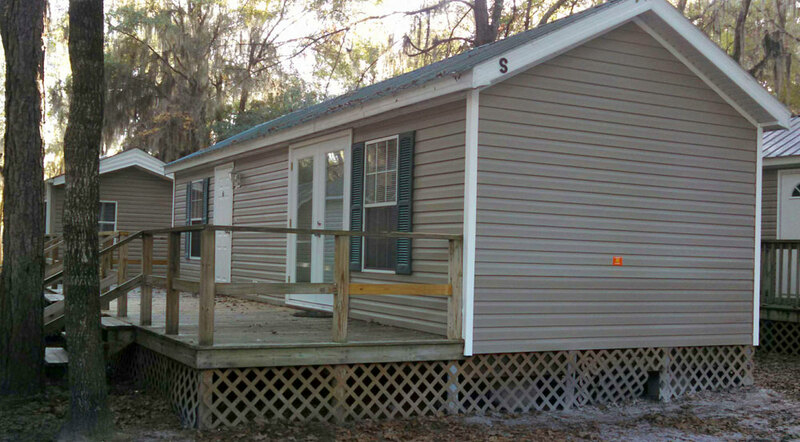 Includes (1) One Bedroom Cabin with a pull out couch, efficiency kitchen, bathroom, TV, climate control. Looking to purchase an Ultimate Incident VIP Package as a gift for a friend or family member? In order to accommodate this, the original purchaser must contact our VIP Concierge Team (vip@suwanneehulaween.com) to authorize an alternate pick-up person at least 2 WEEKS before the event date. This authorization will allow a friend or family member to pick-up the VIP Package on the purchaser’s behalf. All informational emails and correspondence will still go to the original purchaser and it is up to them to relay the information to the guest that is attending the event.